We are having coffee with a friend in Vancouver; sitting outside at our regular haunt putting the world to rights as usual. Our friend comments, “ Well, you know the big thing nowadays for organizations is “reaching out”. We talk about this “reaching out” and what it means or implies: communicating, engaging with interested parties. Later on, I reflect on “reaching out” and my thoughts turn to the Confrérie du Raisin D’Or de Sigoulès in South West France and the efforts that they make to reach out to many groups in the course of their activities during the year. I wrote about the history and current role of Confréries in France and in particular about the Confrérie du Raisin D’Or de Sigoulès in the July 2014 article on my website. 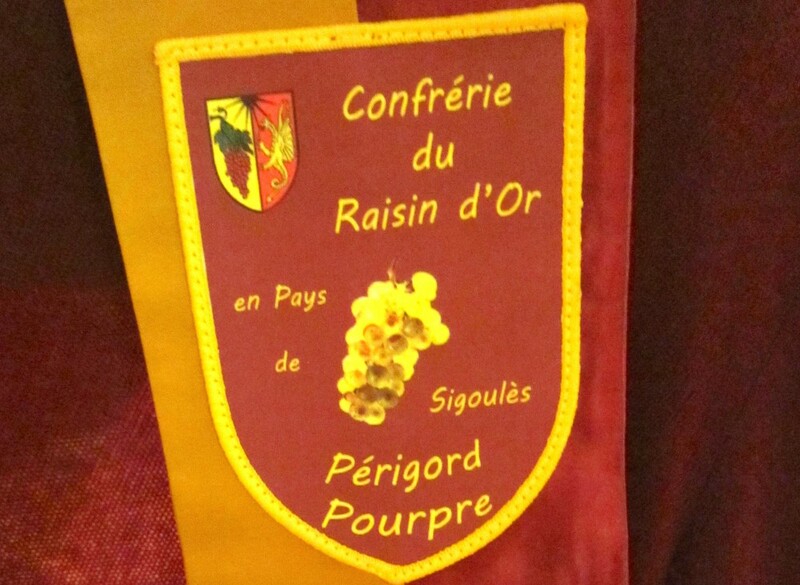 In summary, the Confrérie du Raisin d’Or de Sigoulès is one of a large network of confréries or organizations of men and women across France whose objective is the promotion of their local area and culture as well as gastronomic products. UNESCO has recognized the gastronomic heritage of France as an expression of Intangible Cultural Heritage and the confréries are included in that recognition. Tourism plays a major role in the French economy and the Confréries, with their links to the past and involvement with the gastronomy of the area are usually associated with a tourism organization in the vicinity. In some ways, this feels like a lot of words on a page and high-level policy. On the ground, what is the value proposition? It’s about promoting the local area, culture, food and wine to residents and visitors. Aside from the annual major event for each Confrérie called the Chapitre, and attending the Chapitres of other Confrèries, local events are organized that reach out to others. The magic of the work of the Confrérie du Raisin d’Or de Sigoulès of which I am so fortunate to be a member, albeit from a distance much of the time, comes alive for me in particular ways. 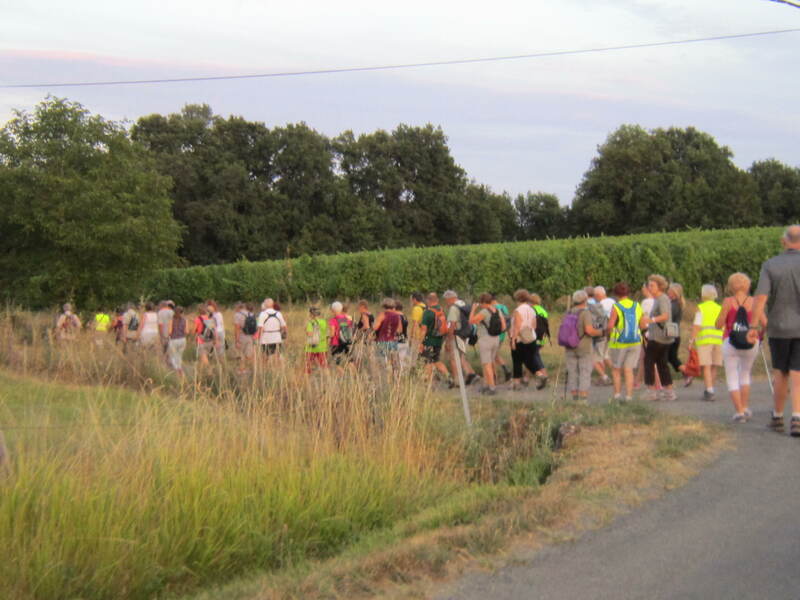 One way is in walking with people who take part in the summer time Confrérie organized hikes, which focus on the discovery of the local countryside. I pass the time of day with other hikers: why do they come? What’s it all about for them? Consistently, the response is that they love the countryside, the opportunity to explore the area with other people with similar interests. They appreciate the fellowship offered by the Confrérie du Raisin D’Or de Sigoulès. Often they are people who live in Bergerac, the local main town, and sometimes they have recently retired there after a career in Paris or overseas. They want to connect with the soil, the trees, the birds, the mushrooms, the wild flowers; these things are important to them. At the end of each hike, there is an opportunity to enjoy refreshment with others. On offer is a glass of local wine or juice and a savoury biscuit. Un pot d’amitié, a cup of friendship, to which participants are invited to donate a small amount to cover costs. All this is organized and brought to the assembly point by members of the Confrérie. This is the magic of the countryside and fellowship. Another expression of this magic is attending concerts organized by the Confrérie in local mediaeval churches. How good can it get to listen to talented musicians in this kind of setting? 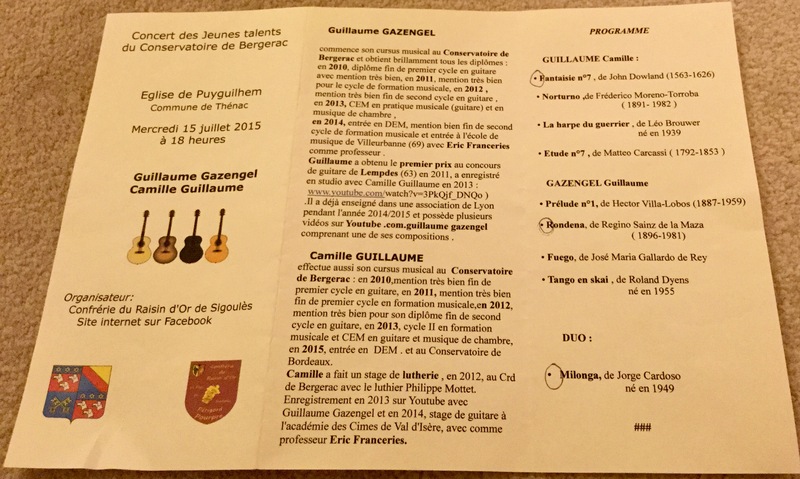 One example from this summer is a concert held at the church in Sigoulès featuring a flautist and guitarist playing music from both sides of the Pyrénées. These musical pieces are by composers who originated from different regions of the French and Spanish Pyrénées: Gabriel Faure, Maurice Ravel, Georges Bizet, Pablo de Sarasate, and Isaac Albeniz. These are some of my favourite composers. 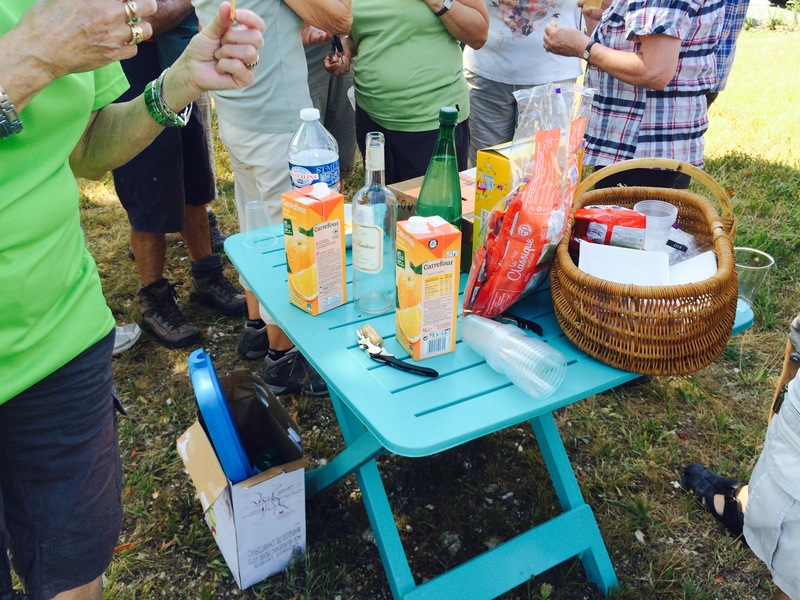 Afterwards, we stand and chat in the shade of the plane trees and enjoy un pot d’amitié – a glass of wine from a Sigoules winemaker. 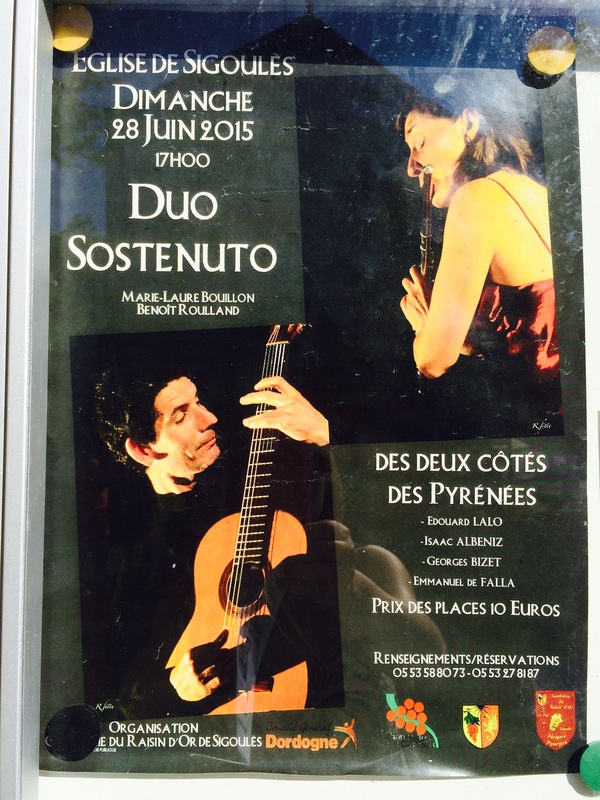 Another example is a concert of young talented musicians from the Conservatoire de Bergerac. In this instance, two young guitarists. On the programme, which I have shown here, I circled the pieces I particularly enjoyed. At the end of the performance, as an encore, they played a rendition of Stevie Wonder’s famous song: “Isn’t She Lovely”. I loved the repetoire, the imagination and the skill of these two young people. Afterwards, there is an opportunity to meet other concertgoers and enjoy a cup of friendship again: wine or juice with a slice of ham and cheese cake offered by Confrérie volunteers. 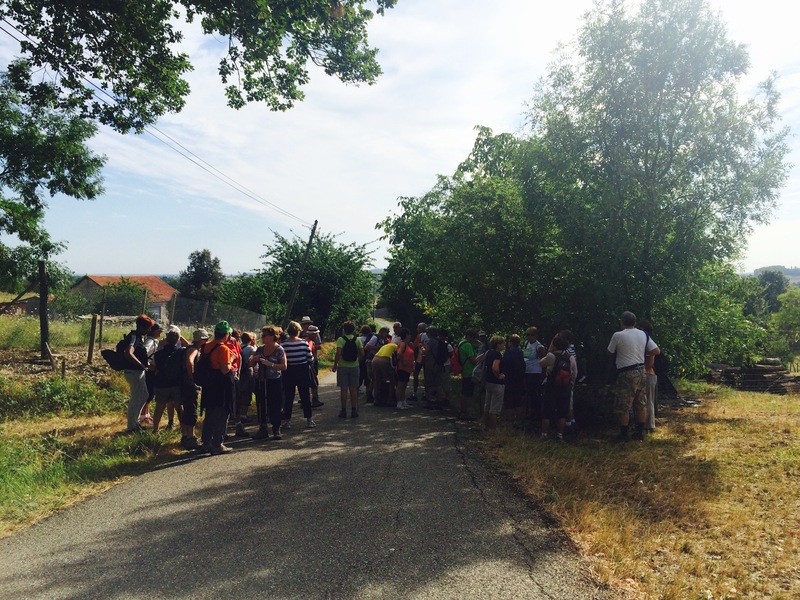 We stand, smile and chat in the warm, early evening sunshine outside the church at Puyguilhem in the Commune of Thenac from where it is possible to see in the distance where the 100 years began and in another direction where it ended. This is the magic of time and place, music and fellowship. Who does all this reaching out? Committed members of the Confrérie who give countless hours of their time to promoting this region of France that they love and value, to engaging with local residents and visitors and to using their skills and talents in the interests of others. For me, all this effort is about getting to the heart of matters in ways that people value. This is “reaching out” at its best. As our friend in Vancouver suggests, reaching out is a big thing. This entry was posted in Art and Music, Bergerac Wine Region, Confréries in France, culture, French Wines, Hiking/Randonnees, History, wine tourism and tagged 19th Century french composers, 19th century Spanish composers, Bergerac wine region, Communal the de communes des citaux de Sigoules, Conscious General de la Dordogne, Dordogne tourism, Flute music, French wine tourism, Guitar Music, Hiking in france, Hiking in the Dordone, Music events in france, South West France, Stevie Wonder, UNESCO Intangible Cultural Heritage, wine travel by elizabethsvines. Bookmark the permalink. Ah you are so right to support the Conference. In a world that is increasingly digitally connected that there are real people to meet and talk to and when I see the droves tapping away at a screen as I do (!) in Paris I wonder. Ask les Saintes apres tous c’est La Toussaint aujourdui. A bientot et merci milles fois pour le blog. Merci Stephen for your kind comments. I know what you mean -having a conversation, connecting with people and enjoying the moment is so important. You’ve helped me to see Sigoulès in a whole new light! Excellent! Thanks for your comment.